This is a very beautiful 18K GOLD clad Black Cocktail ring. 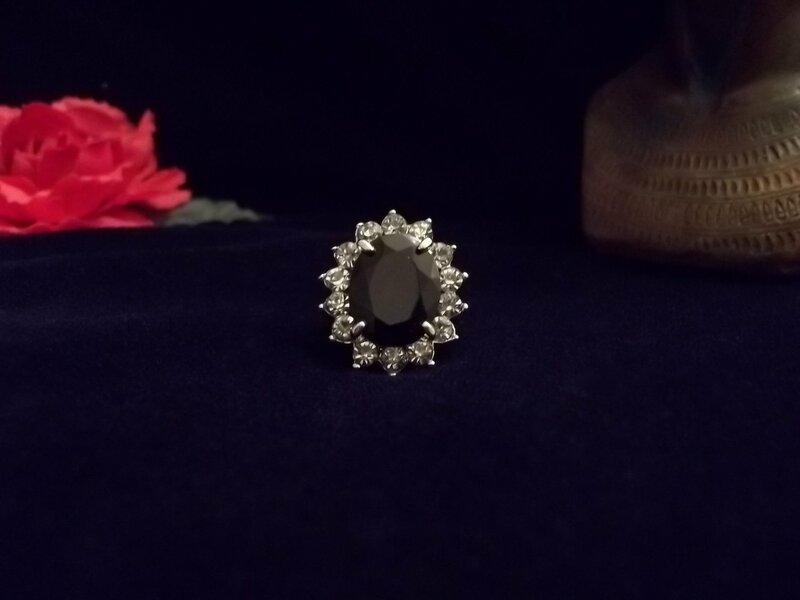 The Black Cubic zirconia is the highlight of this ring surrounded by smaller stones around the outside. Very sparkly and noticeable. This ring is gold clad so it should last for a long time with proper care. As with all jewelry avoid wearing near harsh detergents, when not being worn it should be stored in a plastic bag to prevent it from getting scratched. Item is shipped within three business days of payment approval. Please allow ample shipping time depending on the item destination. We offer free shipping to most countries . If you have ANY problems, concerns or questions please contact us for a prompt response. Once the item has arrived we would appreciate Your feedback and rating. As we are an online store We depend very heavily on customer satisfaction and good ratings. Before leaving negative or neutral feedback please contact us. Thank You for viewing our item. FEEL FREE TO CHECK OUT OUR STORE karmaboutique.ecrater.com AND HAPPY SHOPPING!